We're still laughing about these provacative mouth urinals. Created by Dutch designer Meike van Schijndel, this conspicuous bathroom decor will astonish anyone using your men's room. And it may even be cleaner: How many guys would miss this target? 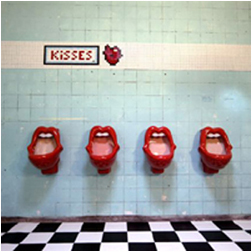 Kisses at Bathroom Mania.